/ Destin FL Cocktails / Say, “I LOVE YOU” on VALENTINE’S DAY With TACOS, CORONAS, & MARGARITAS – Now That’s AMORE! ROCK’N BINGO@7PM! Say, “I LOVE YOU” on VALENTINE’S DAY With TACOS, CORONAS, & MARGARITAS – Now That’s AMORE! ROCK’N BINGO@7PM! Get ready for some GOOD TIMES TODAY@7PM with ROCK’N BINGO! Great music, a ton of bingo fun that brings a smile and a cheer as you rack up the wins. Classic Rock, 80’s, 90’s, and 2000’s Music Rounds, FREE TO PLAY, & WIN FREE PRIZES! 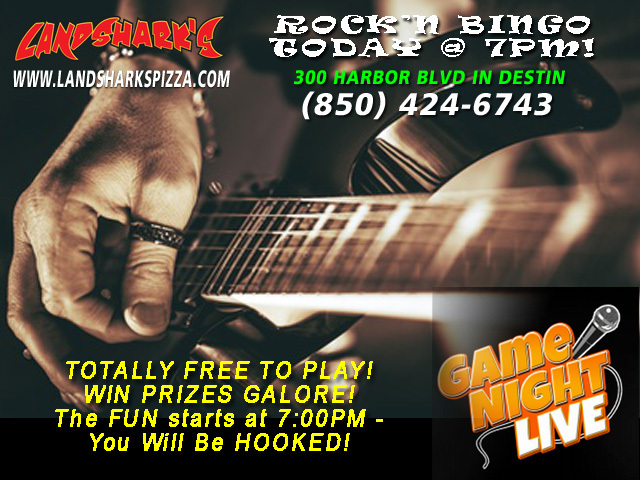 Get energized, get some fun in your day at Landshark’s with ROCK’N BINGO! 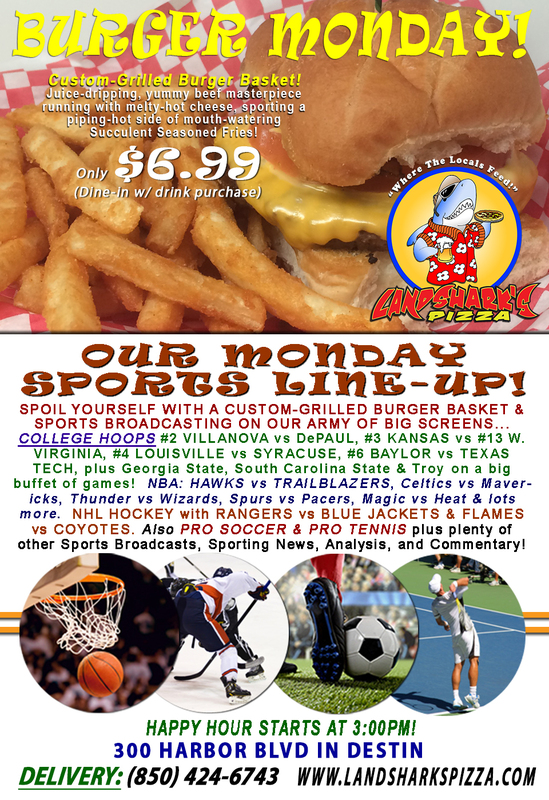 SPORTS ON OUR ARMY OF BIG SCREENS – Blazing hot College Hoops with #15 FLORIDA GATORS vs AUBURN, LSU vs OLE MISS, NEBRASKA vs PENN STATE, OHIO STATE vs MICHIGAN STATE, TEXAS of OKLAHOMA, Tennessee vs #13 Kentucky, Mississippi State vs Georgia, & #25 Notre Dame vs Boston College on the hoops buffet! NHL HOCKEY action AVALANCHE vs DEVILS, Canucks vs Penguins, Islanders vs Maple Leafs, Stars vs Jets & more! NBA featuring CAVALIERS vs TIMBERWOLVES, Bulls vs Raptors, & Lakers vs Kings on tap. 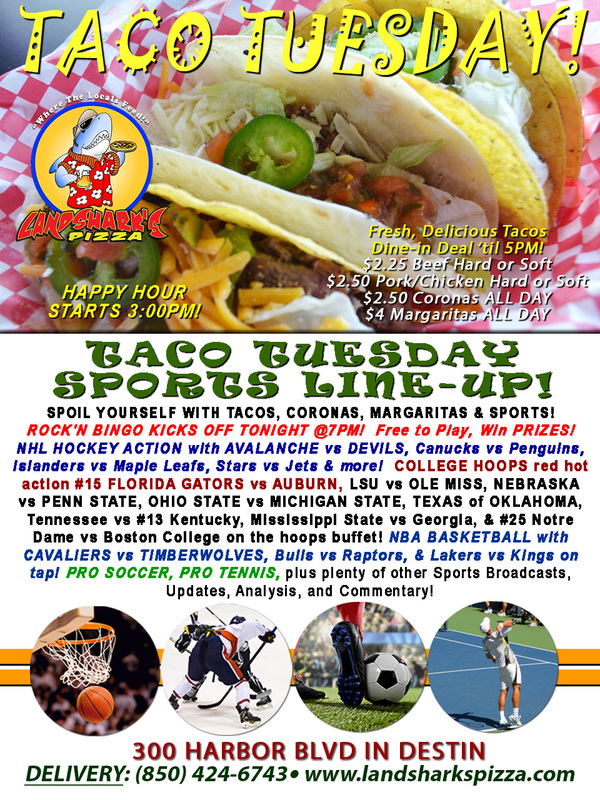 Also PRO TENNIS & PRO SOCCER plus plenty of other Sports Broadcasts, Sporting News, Analysis, and Commentary! Previous Post: « Classic American Burgers & Craft Beer Specials Today in Destin! 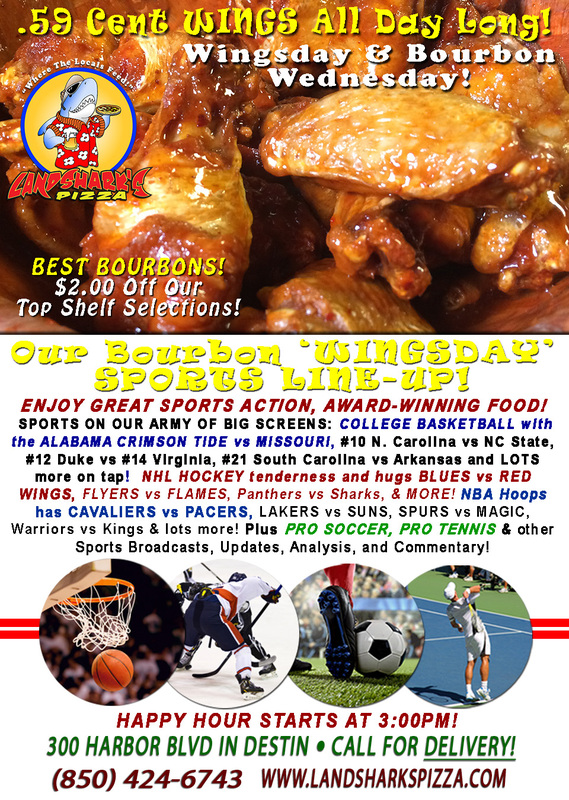 BEER TASTING@6PM, COLLEGE HOOPS, NBA, NHL & PRO TENNIS & SOCCER!